The most important challenge facing car manufacturers today is to offer vehicles that deliver excellent fuel efficiency and superb performance while maintaining cleaner emissions and driving comfort. This paper deals with i-VTEC(intelligent-Variable valve Timing and lift Electronic Control) engine technology which is one of the advanced technology in the IC engine. i-VTEC is the new trend in Honda's latest large capacity four cylinder petrol engine family. The name is derived from 'intelligent' combustion control technologies that match outstanding fuel economy, cleaner emissions and reduced weight with high output and greatly improved torque characteristics in all speed range. The design cleverly combines the highly renowned VTEC system - which varies the timing and amount of lift of the valves - with Variable Timing Control. VTC is able to advance and retard inlet valve opening by altering the phasing of the inlet camshaft to best match the engine load at any given moment. The two systems work in concern under the close control of the engine management system delivering improved cylinder charging and combustion efficiency, reduced intake resistance, and improved exhaust gas recirculation among the benefits. i-VTEC technology offers tremendous flexibility since it is able to fully maximize engine potential over its complete range of operation. In short Honda's i-VTEC technology gives us the best in vehicle performance. The latest and most sophisticated VTEC development is i-VTEC ("intelligent" VTEC), which combines features of all the various previous VTEC systems for even greater power band width and cleaner emissions. With the latest i-VTEC setup, at low rpm the timing of the intake valves is now staggered and their lift is asymmetric, which creates a swirl effect within the combustion chambers. At high rpm, the VTEC transitions as previously into a high-lift, long-duration cam profile. The i-VTEC system utilizes Honda's proprietary VTEC system and adds VTC (Variable Timing Control), which allows for dynamic/continuous intake valve timing and overlap control. The demanding aspects of fuel economy, ample torque, and clean emissions can all be controlled and provided at a higher level with VTEC (intake valve timing and lift control) and VTC (valve overlap control) combined. 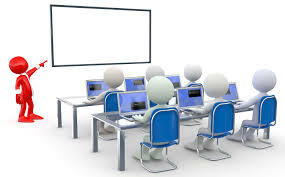 The i stands for i ntelligent: i-VTEC is intelligent-VTEC. Honda introduced many new innovations in i-VTEC, but the most significant one is the addition of a variable valve opening overlap mechanism to the VTEC system. Named VTC for Variable Timing Control, the current (initial) implementation is on the intake camshaft and allows the valve opening overlap between the intake and exhaust valves to be continuously varied during engine operation. This allows for a further refinement to the power delivery characteristics of VTEC, permitting fine-tuning of the mid-band power delivery of the engine. The basic mechanism used by the VTEC technology is a simple hydraulically actuated pin. This pin is hydraulically pushed horizontally to link up adjacent rocker arms. A spring mechanism is used to return the pin back to its original position. To start on the basic principle, examine the simple diagram below. It comprises a camshaft with two cam-lobes side-by-side. These lobes drive two side-by-side valve rocker arms. The two cam/rocker pairs operates independently of each other. One of the two cam-lobes are intentionally drawn to be different. The one on the left has a "wilder" profile, it will open its valve earlier, open it more, and close it later, compared to the one on the right. 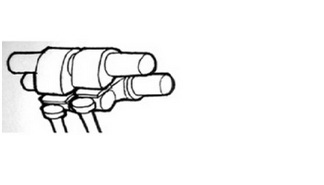 Under normal operation, each pair of cam-lobe/rocker-arm assembly will work independently of each other. VTEC uses the pin actuation mechanism to link the mild-cam rocker arm to the wild-cam rocker arm. This effectively makes the two rocker arms operate as one. This "composite" rocker arm(s) now clearly follows the wild-cam profile of the left rocker arm. This in essence is the basic working principle of all of Honda's VTEC engines. This new engine utilizes Honda's "VTEC" technology, which adjusts valve timing and lift based on the engine's RPM, but adds "VTC" - Variable Timing Control - which continuously modulates the intake valve overlap depending on engine load. The two combined yield in a highly intelligent valve timing and lift mechanism.In addition to such technology, improvements in the intake manifold, rearward exhaust system, lean-burn-optimized catalytic converter help to create an engine that outputs 103kW (140PS) @ 6300rpm,and provides ample mid-range torque. It also satisfies the year 2010 fuel efficiency standard of14.2km/Landreceives the government standard of "LEV" . From now onwards, there is all likelihood that Honda will implement i-VTEC on its performance engines. Again what i-VTEC does allow is for Honda to go for the sky in terms of specific power output but yet still maintaining a good level of mid-range power. Already extremely authoritative reviewers like BEST motoring have complained about the lack of a broad mid-range power from for e.g. the F20C engine. In a tight windy circuit like Tsukuba and Ebisu, the S2000 finds it extremely tough going to overtake the Integra Type-R in 5-lap battles despite having 50ps or 25% more power. To get the extreme power levels of the F20C, the wild cams' power curve are so narrow that there is effectively a big hole in the composite power curve below 6000rpm. What i-VTEC can do to this situation is to allow fine-tuning of the power curve, to broaden it, by varying valve opening overlap. Thus this will restore a lot of mid-range power to super-high-output DOHC VTEC engines allowing Honda, if they so desire, to go for even higher specific outputs without too much of a sacrifice to mid-range power. i-VTEC system is more sophisticated than earlier variable-valve-timing systems, which could only change the time both valves are open during the intake/exhaust overlap period on the transition between the exhaust and induction strokes. 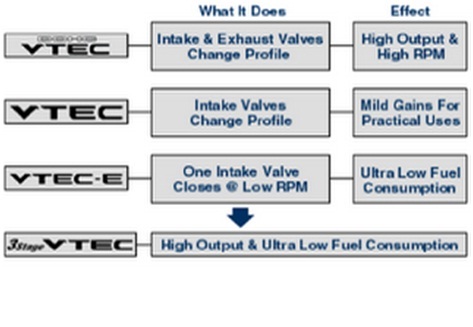 By contrast, the i-VTEC setup can alter both camshaft duration and valve lift. i-VTEC Technology gives us the best in vehicle performance. Fuel economy is increased, emissions are reduced, derivability is enhanced and power is improved.